Simon started the third week of Daily Brunch with Ocado with two rich and meaty recipes: Pork and Apricot Sausage Rolls, and Duck Tagliatelle. These pork and apricot sausage rolls make a delicious snack, picnic dish, or light lunch. They are really simple to make using shop-bought puff pastry, but look and taste so much better than pre-packaged versions. Dunk them in Simon’s fruity and spicy dipping sauce for an indulgent savoury treat. Mix the apricots, Worcestershire sauce, Tabasco sauce, thyme, sage and sausage meat, and season well with salt and freshly ground black pepper. Mix until thoroughly combined. Fold the other side of the pastry over onto the egg-washed edge. Press down to seal and trim any excess. Cut each pastry roll into 3 big sausage rolls. Mix the ketchup, mango chutney and chilli sauce together. Serve the sausage rolls with a bowl of sauce for dunking. 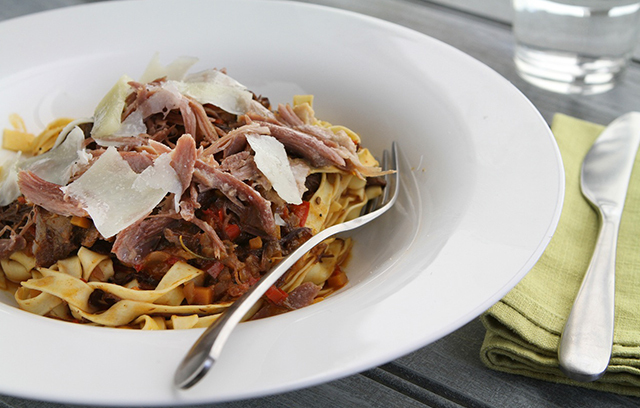 Simon’s rich and hearty Duck Tagliatelle is a delicious alternative to traditional beef or pork ragù sauces. Simon uses tinned confit duck, which is easy to prepare but adds a meaty richness to the finished sauce. This would make a perfect dinner party dish served with fresh egg pasta. For the duck ragù, heat the oil in a large saucepan over a medium heat. Add the onions, carrots, celery, garlic, chilli and pepper and fry for 5-6 minutes, or until softened. Add the tomato purée, stir well and cook for 7-8 minutes, until the mixture becomes a rich red colour. Add the wine, stock and rosemary sprig and bring to boil. Add the duck meat and reduce the heat to simmer for 45 minutes to an hour, or until the meat falls apart. Meanwhile cook the tagliatelle according to packet instructions. Finally add the tagliatelle to the ragù and warm through. To serve, spoon out into bowls and garnish with shavings of pecorino cheese. This entry was posted in Daily Brunch, Talking Ocado and tagged Channel 4, Cook, Cooking, cooking from scratch, Daily Brunch with Ocado, food, foodie, good food, Groceries, home cooking, Ocado, Ocado deliveries, Ocado groceries, ocado.com, Princess, Recipes, shopping, Shopping at Ocado, Simon Rimmer, Tim Lovejoy, TV Chef by Ocado. Bookmark the permalink.